Social Anxiety Forum > Discussion > General Discussion > How are you feeling? This is just a place to vent, feel happy or feel sad or whatever your mood! 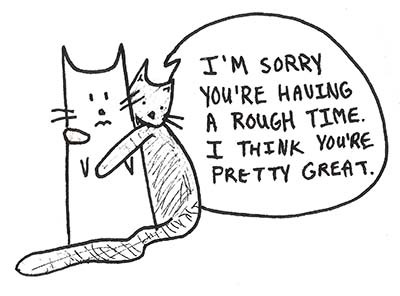 But if you are feeling glum, this is to anyone who needs a hug! and if you are having a rough day, just know that someone out there cares about you. How did you disappoint yourself this time? "In this blackened Wonderland I am the darkened Alice." & the place you need to reach. but always keep them on a leash. Just a place to vent, feel happy or feel sad or whatever your mood! Theres plenty of mood threads, not to sound like a jerk but there is a Search option in this forum that is very usefull. thats the hassle.. if i was to search for each mood thread..
and there so much mood someone can experience.. and its not just 1 word. in here, you are free to say how ever you feel in your own words. Plus.. wouldnt it be server space saving, if all those thread put into 1? Like ****ing ****, and I've lost count of all the reasons. Every time I fall asleep tonight I soon awake with leg and gut spasms for no apparent reason. There's also acid indigestion. I've decided to not sleep and feel much healthier for it but will suffer with fatigue the rest of the day. I guess my mood's related to GAD and manifesting physically. a mixture of sadness and numbness for me. I can't sleep, the coyotes are screaming. Its a fool moon night, and I'm lonesome. Other than that I'm happy. Well if anyone wants to vent or have someone to listen to. Feel free to post on my profile in the visitor section and I'll offer some input if I have any or comfort. Sad, pathetic, angry, frustrated, and doomed. I've been having ups and downs ... directly to do with someone. I think I'm a bit obsessed and it's a horrible feeling ... when I'm talking to them I feel ok but then when I'm not it makes me feel sh*t. I just hope that things will turn out ok. I feel fantastic! I went in for an interview and it went awesome! I will hopefully we at work in the next few weeks. Yessss.